A majority of councillors surveyed by IrishCycle.com on the Liffey Cycle Route want to keep the route on the quays, but a number of indicators points to a strong undecided element among elected respenstives. 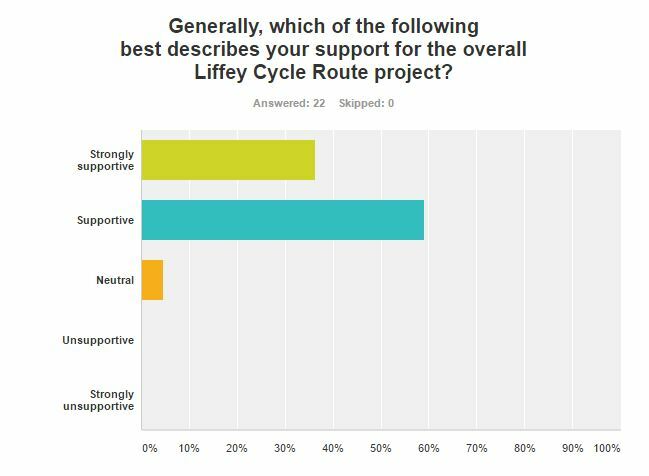 On the question of general support for the concept of the Liffey Cycle Route, 95.24% of responding councillors said they supported or strongly supported the route. On the issue of keeping the cycle path section of the route on the quays councillors were asked: “For the section between Heuston station and the Four Courts, which of the following best describes your position on keeping the Liffey Cycle Route on the quays?”. On this, 57.15% of respondents said they supported or strongly supported this. while 38.1% said they were neutral or undecided (the option was ‘neutral’ but a large number used this to indicate ‘undecided’). Just one councillor (4.78%) said they opposed keeping it on the quays, while another councillor indicated by email that they were unsupportive of the whole project. The survey response rate equals 32.8% of councillors 21 of 64. 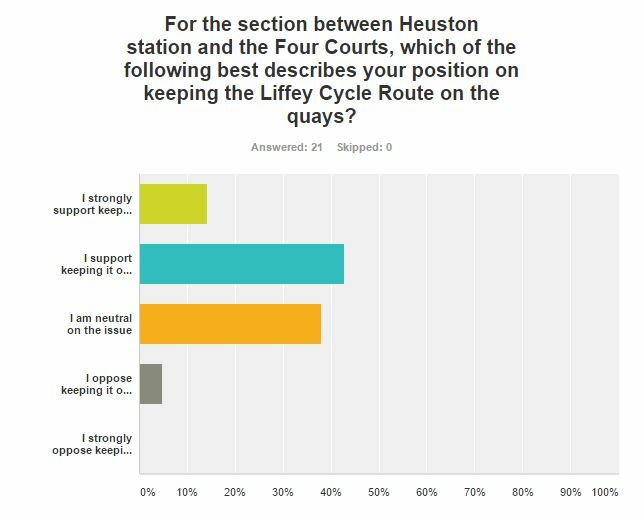 We surveyed councillors after a strong show of support from members of the public for keeping it on the quays — up to today, 1,319 people have signed a petition to keep the route on the quays. IMAGE: The full results can be read on Google Sheets — click image. Dublin politicians: What’s your view of the Liffey Cycle Route plan? The purpose of this survey is to confirm the views of politicians based in the Dublin City Council area to the latest plan for the Liffey Cycle Route. The route — in planning since 2011 — is supposed to provide for safe and attractive cycling and walking between the Phoenix Park and the Point Village. It is aimed to be useful for residents, commuters, shoppers and tourists. Recently opened segregated cycle paths in London, which have on average increased cycling on those routes by 60%, show the potential of pent-up demand. Dublin City Council’s transport department said recently that it wants to detour the Liffey Cycle Route off the quays and onto backstreets around Smithfield — the new plan goes against widely-publicised public consultation on the project and so-far nearly 1,200 people have signed a petition looking for the route to be saved and kept on the quays. Q3: Generally, which of the following best describes your support for the overall Liffey Cycle Route project? Q4: For the section between Heuston station and the Four Courts, which of the following best describes your position on keeping the Liffey Cycle Route on the quays? I didn’t support this option in the original submission stage. I want to see this project happen sooner rather than later but I feel this proposal will delay things due to the proposed extension of Cropped Acre (only just re opened) and the re routing of buses up Benburb Street. I believe the overall costs of this particular proposal will be a hindrance to anything happening. We need to ensure that we develop a route that is effective and safe for all transport modes and is one that can be delivered. Option 5 offered by the Council could be a better option. The City needs to attract footfall from all sections in order to compete with free car parks in outher City Shopping centres I am very worried the City will die like so many other City Centres until we have good public transport we need to ensure we don`t lose this very valuable section of the community. I am supportive of keeping the cycle route. It doesn’t make sense to take the route off the quays. There are too many resident and business against this plan and a building was given planning permission on the route that it was proposed to take. The practicality of keeping it on the quays out ways the unpractical plan to take it in and around smithfield. It appears to be the route most favoured by cyclists, and we should prioritise facilitating cyclists and pedestrians on main routes in the city. I would hope that whatever route is proposed/chosen will be one that best caters for the needs of cyclists in terms of safety etc but also considers the needs of motorists.I will examine all options and make my decision based on facts presented but also taking account of the public views. The problem is that at Liam Mellows bridge where the road width reduces to around 10m. This allows space for footpaths, a two way bike lane, a bus lane, a car lane but not all four. If we divert buses or cars off the Quays there will be noise and pollution problems on Benburb Street. We may also have real difficulties if we divert buses back down Queen Street on to the Quays as the corner is very tight for them to turn left back onto the Quays. I’m also not convinced that extending the Croppies Acre park to the quayside is the best solution as it would mean building a new road alongside the Luas tracks. I’ve blogged about this previously. I’d be happy to meet up on site to have a look at the issue if you were free at some stage. It is a very thorny problem to solve and i would welcome any additional insights that you may have. As a cyclist I would prefer to cycle along the quays. But the fact that there is planning permission for a new development along the proposed alternative route for the buses will make it more difficult to keep a dedicated cycle lane along the quays. I have not been heavily involved in this issue but if possible I would like it kept on Quays..that is a qualified yes as I do not have all the facts. What I want primarily is a safe cycle route. I think the traffic on the quays should be reduced and a lane provided for cycling/walking and the potential of planting trees right the way up along the Liffey from Heuston to the sea should be investigated.